Current and Lifetime Engagement are a way of dealing appropriately with content that gets reposted from time to time on Facebook, or goes viral on a social platform long after it was originally published. Lifetime Engagement refers to all the engagement that the story in question has ever generated. Current Engagement focuses on a much smaller time period - ranging from a few hours to a couple of days. 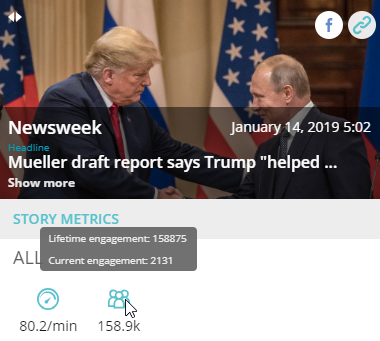 The default view shows both the Current Speed and the Lifetime engagement. By hovering over the engagement and speed icons, you can see the breakdown of metrics. In many cases, Current and Lifetime engagement will be the same thing (the majority of content is never reposted and does not last more than a few days). In the post section, you'll see every instance of the story being posted and the total engagement it has ever picked up. If you've any other questions, please let us know!